The books of reference used for this study of the book of Exodus were the Bible, King James Version, called "The Companion Bible", Publisher Kregel; Strong's Exhaustive Concordance of the Bible, numbered to the Hebrew, Chaldee, and Greek, and English, coded to the Strong's Concordance numbers. Chapter 1 "Numeration and Order of Service." Chapter 2 "Order of Encampment." Chapter 3 "Numeration of the Levites." "Levites Substituted for the Firstborn. [11 - 51]"
Chapter 4 "Levites: the Order of their Service:"
"Command Given. [1 - 33]"
"Command Completed. [46 - 49]"
Chapter 5 "Laws and Events. [5:1 - 9:23]"
"Necessary Laws: [1 - 31]"
"Jealousy: Guilt and Innocence. [11 - 31]"
Chapter 6 "VOLUNTARY (The Nazarite Vow). [1 - 21]"
"The Priests' Law. Blessing. [22 - 27]"
Chapter 7 "Dedication of the Altar Arrangement. [4 - 9]"
"The Arrangement. [11 - 89]"
Chapter 8 "Laws for the Priests and Levites." Chapter 9 "Laws for the People, Passover. [1-14]"
"Concerning the Second Passover. [9-14]"
"Event, Erection of Tabernacle. [15-23]"
Chapter 10 "Journeyings and the order of March. [1 - 36]"
"Murmurings of the People. 1 - 34]"
"Plagues on the People. [4 - 34]"
"Lusting for the Flesh (meat). 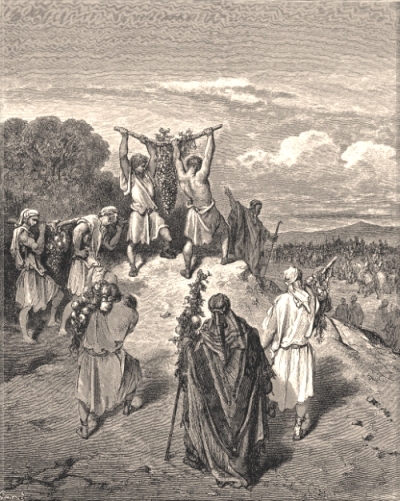 [4 - 9]"
"Complaint of Moses. [10 - 15]"
"Flesh Promised by God. [18 - 20]"
"Complaint of Moses. [21 - 23]"
"Elders Obedience. [24 - 30]"
"Flesh Given. [31 - 32]"
Chapter 12 "Murmurings of Miriam and Aaron. [1 - 14]"
"Punishment Inflicted. [4 - 10]"
"Selection of Spies. [1 - 16]"
"Directions to Spies. [17 - 20]"
"Searching of the Spies. [21 - 25]"
"The Reports Back. [26 - 33]"
"Spies Report and its Reception. [1 - 10]"
"Provocation of Yahoveh. [10 - 25]"
"The Episode, Change of Heart. [39 - 45]"
Chapter 15 "Laws and Offerings for the People. [1 - 41]"
"Laws Regarding Offerings. [1 - 29]"
"Presumptuous Sin, Punishment. [32 - 36]"
Chapter 16 "Rebellion of Korah. [1 - 19]"
"The Punishment of Korah. [20 - 50]"
Chapter 17 "Memorial; the Rods. [1 - 13]"
Chapter 18 "Laws for the priests and Levites." "Priests and their Offices. [1 - 7]"
"The Priest's Dues. [8 - 19]"
"Priests and their Inheritance. [20 - 32]"
Chapter 19 "Laws for the People, Water Separation"
"The Red Heifer. [1 - 22]"
Chapter 20 "Events: Journeyings and Murmurings. [20:1 - 25:18]"
"Death of Miriam. [1 - 13]"
"Opposition of Edom. [14 - 21]"
"Death of Aaron. [23 - 29]"
Chapter 21 "Opposition of Arad. [1 - 3]"
"The Fiery Serpents. [6 - 9]"
"Book of the wars of the Lord. [10 - 20]"
"Opposition of Sihon. [21 - 31]"
Chapter 22 "Opposition of Balak. [22:5 - 25:18]"
"Balak's messages to Balaam. 5 - 20]"
"Balaam's journey. [21 - 35]"
"The Rebuke of Yahoveh. [28 - 35]"
"Balak's Reception of Balaam. [36-40]"
Chapter 23 "Balaam's First Parable. [7 - 10]"
"Balaam's Second Parable [18 - 24]"
"Israel's Immutable Privileges. [21 - 24]"
"Balaam Without Enchantments. [25 - 30]"
"Balaam's Third Parable. [3 - 14]"
"Balaam's Fourth Parable [15 - 24]"
Chapter 25 "Balak's Teaching by Balaam [1 - 18]"
"Yahoveh's Action and its Results. 10 - 18]"
Chapter 26 "Command to number People. [1-4]"
"Numbering of the People. [5 - 51]"
Chapter 27 "Inheritance, The Daughters of Zelophehad. [1 - 11]"
"Events of the Law, Moses Successor. [12 - 23]"
Chapter 28 "Law as to Offerings." Chapter 29 "Particular: Regarding Seventh Month (Tisri)." "The Eight Designated Days of the Seventh Month." Chapter 30 "Laws as to Vows. [1 - 16]"
"Vows Made by Women. [3 - 15]"
Chapter 31 "Moses Vengeance on the Midianites." "Journeyings and Order of Settlement; [32:1 to 36:13]"
"Division East of the Jordan. [32:1 - 42]"
Chapter 33 "Journeyings. [1 - 48]"
"First Period. [1 - 15]"
"Second Period. [16 - 17]"
"Third period, No History of it. [18 - 36]"
"Fourth Period. [37 - 49]"
"Division West of Jordan. [33:50 - 36:12]"
Chapter 34 "Review of Journeyings Continued." Chapter 35 "The Levitical Cities. [2 - 34]"
"Cities of Refuge: Description. [9 - 34]"
"Purpose for Cities of Refuge. [15 - 34]"
"Negative Purpose. [26 - 34]"
Chapter 36 "Heiresses. [1 - 12]"